Over the last year, a healthy grain called “quinoa” has been all over the foodie blogosphere. Apparently, it’s the best thing since kale chips. Quinoa, pronounced “KEEN-wah,” looks like tiny brown balls of health. I was skeptical, to say the least. It took me the better part of 2011 to even come around to consider trying it. Actually, what pushed me over was my old UNC college roommate JoAnna’s blog, The Nutrionista. In spite of myself, I was drawn to her recipe for southwestern quinoa salad (with cumin-lime dressing). I’ll be honest, part of this was due to the fact that I used to eat out all the time in college with this girl. She has *good* taste in food. So I threw caution to the wind, went to Ward’s and bought a little sack of quinoa. Cooking on the stove (the process is a lot like cooking white rice), the smell was … interesting. It was kind of like a nutty pot of peas. And yet, once it was done, and I took a bite, I was honest-to-god surprised. And once you add all of the bright veggies and lime dressing, it turns into something altogether amazing. So, do me a favor and try this big bowl of health food. Trust me, if I liked it, I’m sure you will, too. *Note: The chicken is optional. This could totally serve as a vegetarian entrée or a side dish. I used shredded chicken from a chicken I roasted earlier in the week, but any preparation would do, whether you use a rotisserie chicken, bake some breasts, sautee chicken or grill it on the George Foreman. Combine the quinoa and water in a small covered sauce pan and simmer until all the water is absorbed and the grains are light and fluffy, or about 20 minutes. Uncover and let cool. While the chicken and quinoa are cooking, chop your avocados, tomatoes, green onions, cilantro and bell pepper and combine in a large bowl. Add the corn, beans and quinoa and toss evenly. Next, prepare your cumin-lime dressing: whisk together the olive oil, lime juice, garlic, cumin and salt. If using, add the shredded chicken to the salad and pour the dressing on top, stirring well so that the dressing coats the salad evenly. Serve warm, or let it cool in the refrigerator to serve later. This entry was posted on Sunday, February 5th, 2012 at 2:31 pm and is filed under Entrees, Salads. You can follow any responses to this entry through the RSS 2.0 feed. You can leave a response, or trackback from your own site. This sounds good! I’ve been looking for a tasty quinoa dish to sample on my husband and I like the southwestern versions of quinoa salads I am seeing! I’m telling you. If *my* husband liked it, I know yours would! ;) let me know how it goes! 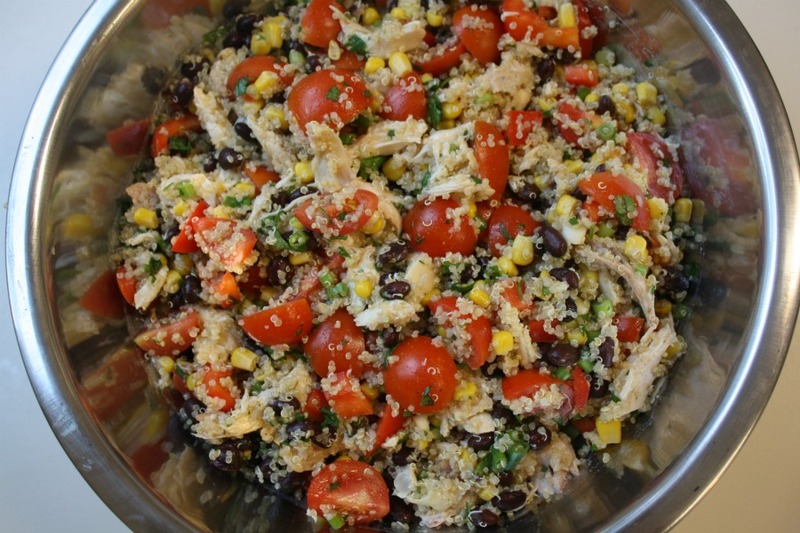 I just had a black quinoa salad recently…will be trying yours soon. Thinking of making this as a quick lunch to eat at work next time, is it better eaten warm or cold? Hi there! When made immediately with just-cooked quinoa and chicken, it is slightly warm, although the veggies and dressing cool it off. A moderate warm, if you will. It’s good this way. The next day, of course, after being in the fridge, it’s cold, which is tasty, too. Honestly, I think either is good, but I definitely eat it cold straight from the tupperware for leftovers. Like soup, it gets better the next day as the flavors meld together. :) Let me know how you like it!